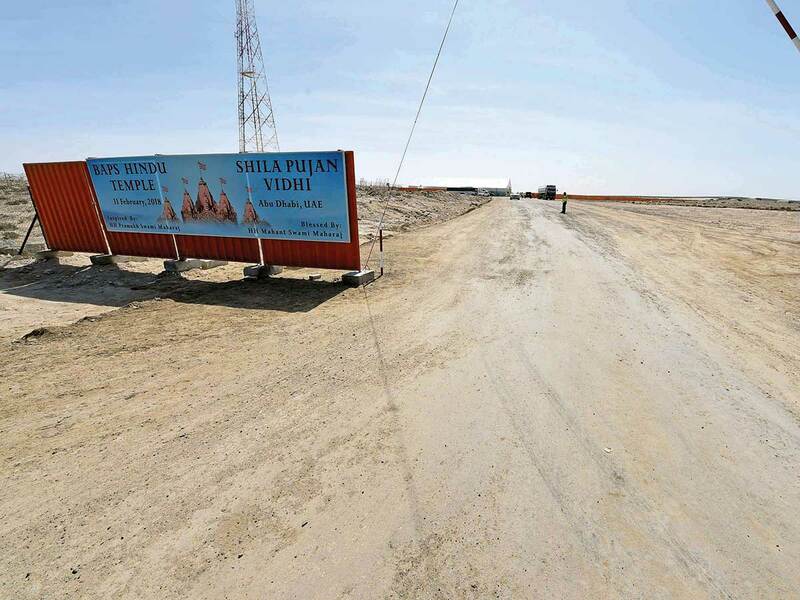 Abu Dhabi: The foundation stone-laying ceremony of the first Hindu temple in Abu Dhabi will be held on April 20, according to the Bochasanwasi Akshar Purushottam Sanstha (BAPS) that is building the temple. The ‘Shilanyas ceremony’ of the BAPS Hindu Mandir will be presided over by the spiritual leader of the BAPS, Mahant Swami Maharaj, confirmed the religious and social organization within the Swaminarayan branch of Hinduism. In a statement to Gulf News, BAPS said Maharaj will be making his first official visit to the UAE from April 18 to 29. “He will preside over the Shilanyas Vidhi (foundation stone-laying ritual) on April 20 with members of the leadership of this nation. Aside from this, His Holiness will perform morning prayers every day [during] which all are welcome for darshan (viewing session for devotees). The exact location and time of these daily prayers are not yet finalized,” it said. The announcement comes as the temple marks a year after the ground-breaking ceremony during which the first rites of Bhumi Pujan –sanctification of the land—were performed at the site in Abu Mureikhah area on February 11, 2018. Witnessing the ceremony through a live stream at the Dubai Opera, Prime Minister of India Narendra Modi had revealed a model structure of the temple with seven towers representing the seven emirates in the UAE. Dubbed an icon of tolerance and religious harmony in the UAE, the temple is being built on 13.5 acres (55,000 square metres) of land gifted by His Highness Shaikh Mohammad Bin Zayed Al Nahyan, Crown Prince of Abu Dhabi and Deputy Supreme Commander of the UAE Armed Forces, to the Indian community. In the Year of Tolerance, the UAE government has gifted an equal area of land additionally for building parking facilities in the temple premises, the priest in-charge of the BAPS Mandir said. “The love and kindness shown by HH Shaikh Mohammad Bin Zayed Al Nahyan, the Crown Prince of Abu Dhabi and the UAE government cannot be expressed in words,” said Brahmavihari Swami. “Time and time again, they have encouraged us and gone out of their way to aid us on this project. This time, to ensure the temple premises can serve the Hindu and the wider community effectively, they have graciously given an additional 13.5 acres of land for parking purposes,” he said in the statement to Gulf News. He said the complex is going to be a special place which has been designed to be an architectural ode to the value of human harmony as espoused by the UAE and India. The designs of the complex that is estimated to cost Dh450m are now being finalised and will be going through approval processes. The Mandir work in India is also progressing with pink stone from Rajasthan and marble from Macedonia scheduled to reach the sculpting sites in the coming months for the craftsmen to begin work. The Shilanyas ceremony in April will observe a sacred Hindu ritual wherein the first foundation stones are sanctified and fixed in the ground as the base of the Mandir. The Mandir’s foundation will then be made on these stones considered sacred. After these ceremonies, construction will begin in this Year of Tolerance, the BAPS said. 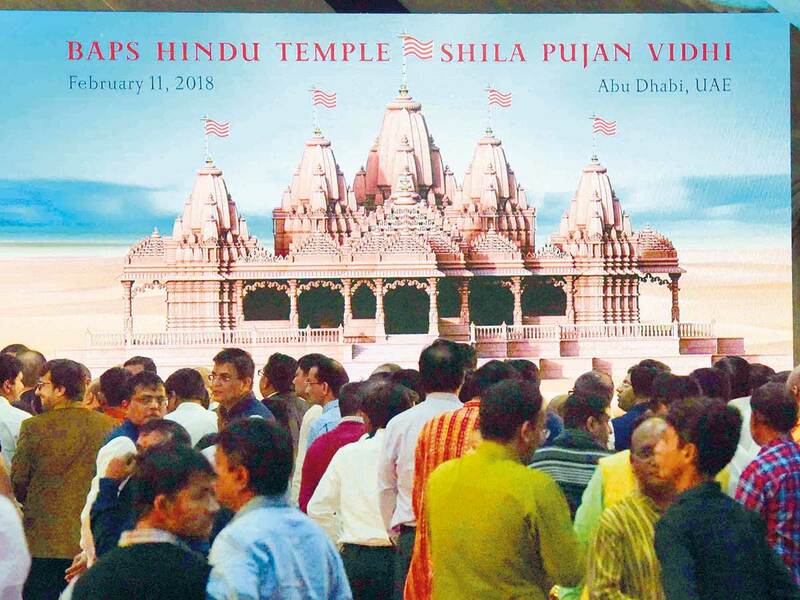 Abu Dhabi: The BAPS Mandir in Abu Dhabi is offering special privileges for attendees of the temple’s foundation stone-laying ceremony on April 20. “On that historic day, yajmans will participate in a special ceremony. And those who wish to become yajmans can contact outreach@mandir.ae,” the BAPS said in a statement to Gulf News. Yajmans or yajamanas are the ritual patrons, on whose behalf a religious ritual is performed by a priest. “However, one and all are welcome from 2pm onwards to have darshan (viewing) of the foundation stones and also have a chance to sprinkle flowers as prayers for the temple,” the statement added. On its website, the Mandir has stated that it will start online registration for the event on the site within the next week. Registered visitors from abroad have also been offered special discounted rates on air tickets and hotel stay. “However, each visitor will be personally responsible for arranging all travel, sightseeing and accommodations for his/her visit,” the announcement added.